Isolating the vasculature of an organ? Is there a chemical or process that would dissolve or remove all other tissues in an organ and leave all the vasculature intact? 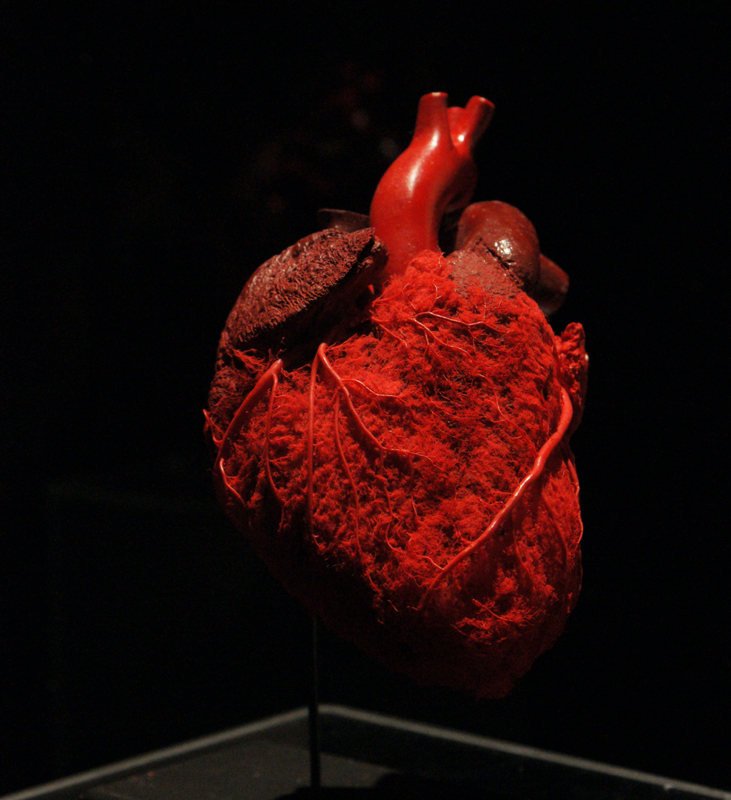 I am planning to make a shelf display of the blood vessels in the heart of a pig for use as a shelf display. The typical name for this technique is "corrosion casting" - if you search for literature on corrosion casting you will find many many papers detailing the technique. Another answer mentions "plastination" but I don't think this is really what you are looking for; plastination is a technique for preserving the tissues themselves (though the "Body Worlds" exhibit that post references also uses corrosion casts extensively). Briefly, in corrosion casting, you gravity or pressure-fill the vasculature with a plastic, typically acrylic. It is best if the vessels are flushed free of blood before injecting the plastic, with saline/PBS, for example. (Organs from a butcher will work fine but you will get better results if you can administer heparin premortem to prevent clotting, which of course is not possible for a meat animal.) The acrylic cures, and then the tissues that remain are digested with a basic solution, ranging from 0.5 M NaOH to 6M KOH depending on the protocol (lower concentrations or NaOH will digest more slowly, higher concentrations or KOH will digest more quickly), often at elevated temperature (~37C). Note that this solution technically digests all of the vasculature as well, but you have already filled the vascular lumens with plastic, so that is what you are left with. I think that you are looking for plastination. Its developer, Gunther von Hagens, uses it to preserve whole bodies as well as selected tissues, such as muscles, nerves and vessels, for teaching uses and the exhibition BODY WORLDS. I think this is the best method, but I'm not sure about its feasibility without a dedicated laboratory. Other methods, such as paraffin embedding, would leave you with the problem of removing the rest of the tissues without using high temperatures. Not the answer you're looking for? Browse other questions tagged cardiology anatomy blood-circulation or ask your own question. What is the blood ejection speed outward from human body vein? what makes our body warm? Is the amount of blood same in the pulmonary and systemic foetal circulation? What is the circulation that allows for nutrient absorption and excrete of metabolic wastes in humans? Why are valves preferentially affected in endocarditis? Is a one ventricle heart feasible? Which word is used to indicate that a vessel is “blood-filled” during a necropsy? Are there macrophages in the blood vessels and within the blood stream? How does a stronger heart reduce the risk of CVD?